I joined a gym last Friday. Again. This one, however, has a pool, so I can swim. When you are heavy, as I am, water is so much kinder to exercise in. I've now gone twice this past week - and I hope that the extreme chlorine in the pool won't turn my dyed blond hair green!! On another front, it appears that we have early migrants this year - the birds seem to be coming south earlier than I've ever seen before. We have a medium sized hawk that preys on the birds that hang out in our yard - mostly pigeons and doves (not that I want the hawk to catch ANY of them). I've only seen this hawk starting in September/October. I suppose it is possible he lives here year round, but I hadn't seen him for months until about a week ago, so I'm thinking he has already migrated south for the winter. Also - our bee hive is growing bigger. Yes, we have a bee hive in our back yard. It's all the way in the back by the fence and hidden in the midst of some tall bushes. It's near the back fence gate that allows AT&T people to get to the pole in back of our house. Everybody else on our street has blocked off the pole with their fences - seems we're the only civilized ones that thought to allow access. Yesterday evening around 7pm, I was sitting outside with my big Cockatoo, feeding him and the neighborhood squirrels, grackles, blue jays and red bellied woodpeckers peanuts - and an AT&T guy knocked on the front fence gate and announced where he was from. I told him to come on in and mentally wondered how this would go since we had to walk by in close proximity (within 4 feet) of the bee hive. I pointed out the hive to him and he immediately said, "that's CRAZY!" and "what happens if you piss them off?" I assured him they are NOT killer bees, since we are around them all the time, mow the lawn around them, etc. - and we proceeded to walk right by them and open the back gate where he did his work. The bees went about their bee business and ignored us. On the way back through the gate to leave, he stopped for a full minute and just stared at the hive - it is indeed SO cool. He then suggested I get some honey, but I'm not THAT dumb. They can live here, but a bee keeper will have to remove them eventually - and HE can get the honey, not me! What you see below is a gourd from North Carolina that was hanging in the tree hoping to attract birds to nest. Two years ago it hosted a hive of bees, but it hosted them INSIDE. When the bees got too crowded inside they left - one day I came home from work and all the bees were gone. I cleaned out the inside of the gourd and rehung it. Now the bees may be inside, but they are building additions to the outside of the gourd. They have built around branches, which are now part of the structure of the honeycombs. It is fascinating to watch. Squirrels and pigeons and other birds go in and out amongst the branches near the hive - and all remains well. I've read about killer bees and how you can't get within 50 feet of them or they attack, they are disturbed by lawn mowers and other creatures like squirrels and birds. Not our bees. I believe they are an escaped hive from some bee keeper because they are very used to people. Now all I need are a couple of chickens (I'd have to build something to house them in with the darned hawk around) and I'll have a mini-farm. Maybe a few goats for goat milk, except they'd eat EVERYTHING and I'd have no butterfly garden anymore. I joke about the chickens with my husband who looks at me in horror because he knows eventually it will probably happen. I know where they sell little chicks.......hee hee. Beware - here is a woman who is doing just that (except she has no garden in the back where the goats are) - and she, too, lives in the suburbs! When I see what she used for a "barn" it got me thinking about chickens again. All I have to do it buy a children's playhouse - and turn it into a chicken house! What a cool idea!! 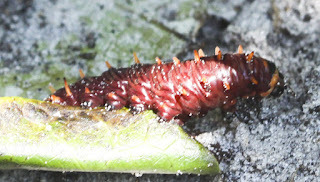 Below is the caterpillar of a Polydamas butterfly. We have two Dutchman's Pipe vines and that is the Polydamas butterfly's larval plant. 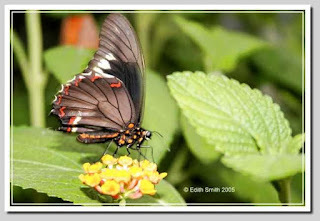 Here is what a Polydamas butterfly looks like, although this is not my picture. The author's name is on the photo. Finally, below is my favorite garden flower/vine. 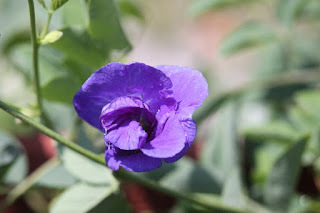 It is a Pea Vine and the flowers are such a beautiful shade of blue/purple. The vine grows like morning glory - out of control, but I'm keeping an eye on it and will trim it back as necessary. Right now, it is growing up one of the "legs" of our home built trellis - which looks like it was home built and not by people who know what they're doing, either. But so what - once it is covered with vines it won't matter what it looks like underneath! We have Dutchman's pipe going up one "leg", the Pea vine going up another, and a pink allamanda going up the third "leg". The fourth "leg" is being nicely covered by a red allamanda vine - it makes my eyes go "mmmmmmmm" whenever I look at it. 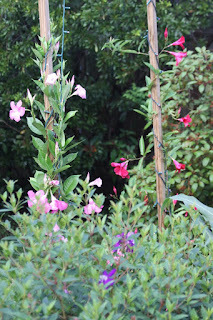 Here are the two Allamanda vines, pink and red, on the other "legs" of the trellis. I am glad you found a way to exercise. You will feel much better if you do it regulary. I love to swim, wish there was a pool near us. I have a friend who goes around collecting bee swarms from people's houses. She makes her living that way. She doesn't get stung, but when her husband tries to help her, he always gets stung! I've been to the gym 3 times now and I love the swimming the best. I also notice that after 10 minutes on the elliptical machine my right leg feels better. My right leg aches at the hip joint a lot because I have scoliosis and my weight is unevenly distributed when I walk. I'm going tomorrow after work - and then I shower there and do my hair. It feels wonderful. Isn't that amazing about some people and bees. 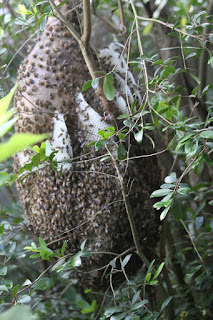 I've read about people who can be covered with bees and not get stung - I'm wondered if our bees are somehow tame. They don't bother us at all, even when we walk close to their nest - close is about 4 to 5 feet. We photograph them - and they just keep about their business. I can't help but feel that they are a blessing sent by God - and so they are gentle. I'm still cautious and not foolish, though - but I love having them here. I always wanted to live in the country, so God gave me country in the suburbs.